Typical sounds that travel through the floor and into the ceiling below are footsteps (impact noise), voices, stereos, barking, and even loud appliances. 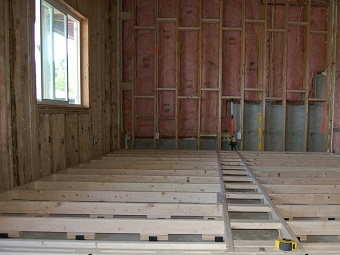 Noise (vibration) can easily transfer down through the floor / ceiling framing. Soundproofing the floor of your condo, studios or apartment can significantly reduce or eliminate this noisy intrusion and make your space more peaceful and quiet for those around you. Before we recommend a system to block the noise, let’s find out what you’re up against. Soundproofing Problem – Impact Noise: Impact noise, also known as footfall noise, occurs with an actual physical impact on the floor above. Might be a footstep or a chair dragging on the floor. Impact noise can also be from objects being moved or rolled across the floor, or vibrations such as those from a washer or dryer. 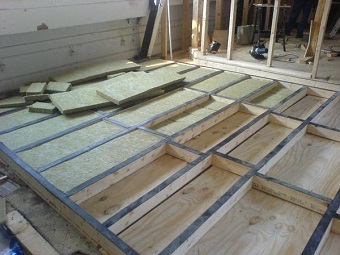 The Only Solution is Decoupling, Mass, Absorption and Damping, four of the 4 Elements of Soundproofing. A very important element. In this case we simply mean make the walls as heavy as you can. Common cost effective choices for heavy materials include Drywall, Plywood, OSB, and Cement Board. 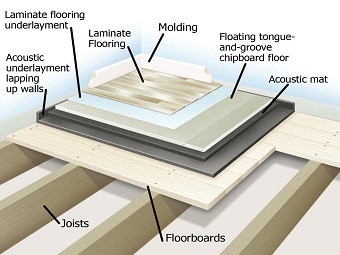 This solution finally addresses the noise vibration right at its source by applying mass and damping to the underside of the problematic subfloor. 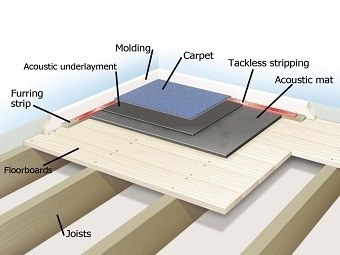 Because this method directly addresses the vibration, there will be much less sound available to travel to the joists as well as your walls below..